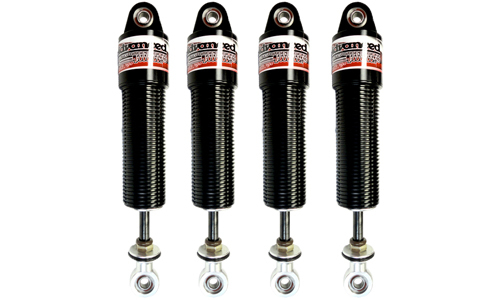 All Four Corners – The 5500 Series shock is designed especially for Quarter Midgets. It has a hard black anodized aluminum body. This shock uses CNC machined aluminum internal parts designed for racing with no aftermarket parts. This shock has a combination of a vase valve design, which allows for very low rod pressure, and a check valve. The air valve allows you to fine tune your gas pressure. This shock accepts 1 5/8″ I.D. Sprints. 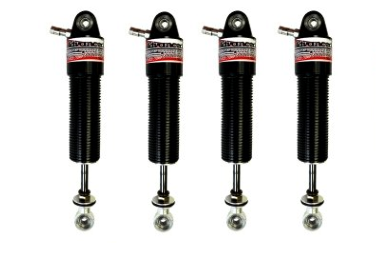 All Four Corners – The 5500 Series shock is designed especially for Quarter Midgets. It has a hard black anodized aluminum body. This shock uses CNC machined aluminum internal parts designed for racing with no aftermarket parts. This shock has a combination of a vase valve design, which allows for very low rod pressure, and a check valve. The gas pressure is already pre-set in the end carp. This shock accepts 1 5/8″ I.D. Sprints.